High in the Andes Mountains of South America, Lake Titicaca straddles Peru (upper left) and Bolivia. This MODIS true-color image from November 4, 2001, highlights the diverse landforms of the region. In the La Paz region of Bolivia, the Andes are still snow-covered ; some of the peaks hold snow year round. Chile (at left along the coast of the Pacific Ocean) presents a barren-looking landscape, but some green is evident in the high-resolution image, especially around rivers. 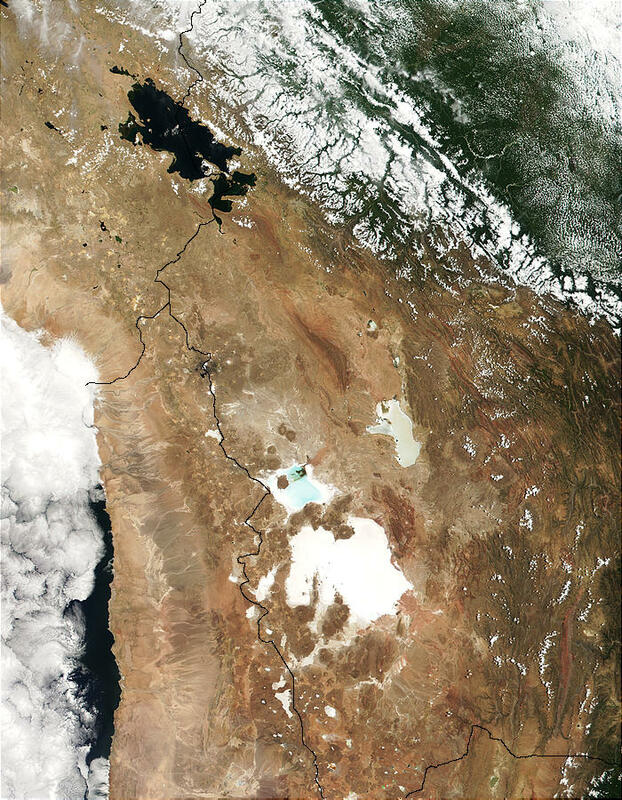 The large white areas are large salt flats and seasonal salt lakes. Lake Titicaca is an important research site for studies of previous climate episodes during Earth's history. The highest of Earth's large lakes, it sits at an altitude of 12,500 ft. on the Altiplano, a high plateau, and the lake bed is deep with sediment layers that can tell a story about climate that reaches back hundreds of thousands-possibility even millions -- of years.